Yiquan is one of the Taoist meditative arts in the same family as Tai Chi Chuan, Qigong, Bagua, and Hsing-i. It translates to Intent – Fist (or grasp) and focuses on the strengthening of one root, qi and intent through standing meditation postures. Resident artist and instructor Willem has produced a reference for key points on how to do standing meditation. 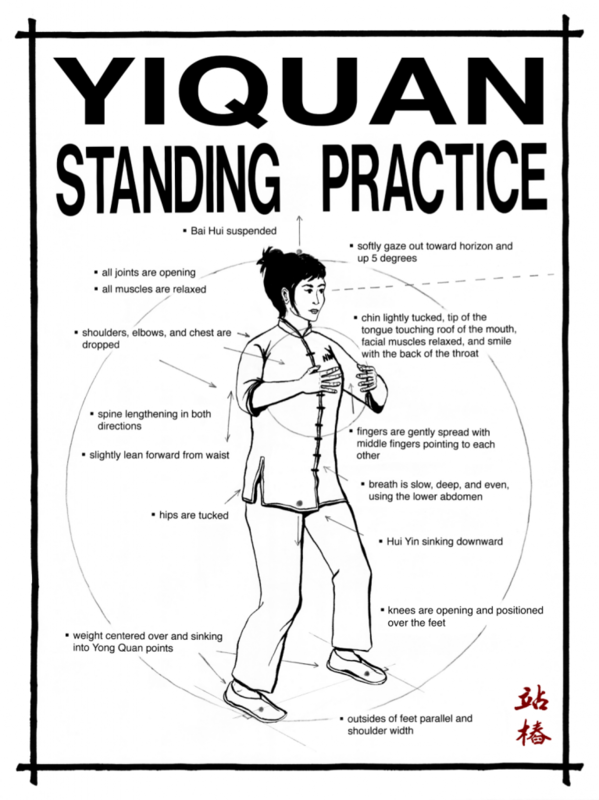 A few key points to be aware of when practicing yiquan. You intent is of vital importance. It is not enough to simply grit your teeth and endure holding the posture to 10-20 minutes. If fact, it’s counterproductive. Do not fixate on discomfort. Choose your focus and purpose. Continually direct yourself to relax while remaining active in the stance. For your standing meditation to be effective it is also vitally important to breathe deeply and freely. Breathe into the abdomen so that the stomach and small of the back expand in both directions on the inhale. Control your exhale, like you are letting air slowly out of a balloon. Each breath gets your full attention. Any time the mind wanders, turn it back to your practice. The feet are shoulder width with the outside of the feet parallel. Relax your shoulders out and down to the sides. Press up lightly with the crown of the head. Align your body and breath as explained above and in the poster. Settle into the stance, focusing on each breath. Hold the pose for 10 minutes to begin with. You may begin to tremble. This is fine. After a few weeks of ten minutes a day the posture becomes pleasant. You will have work much stored tension out of your shoulders and will have built strength in it’s place. To work out deeper issues, stand longer. There is no upper limit. The current record at our studio is about 3 hours. Many have been documented as being able to work this meditation for 12 or more hours. How far you go is determined only by how intense your need. Learn more about our meditation training in Portland, OR. I would like permission to use the above instructions and illustration in a book I am writing about martial arts. I will of course credit the site and also put in the web address. Is Tai Chi for Depression Therapy Effective?